Climate change will be much worse and come much sooner than most people think. Antarctica is melting three times faster than it was a decade ago. Storms and other natural disasters are growing stronger because of the changing climate. Within our lifetime, South Asia – home to 20 percent of the world’s population – could be too hot for human habitation. We should all do our part to slow climate change’s devastating effects. 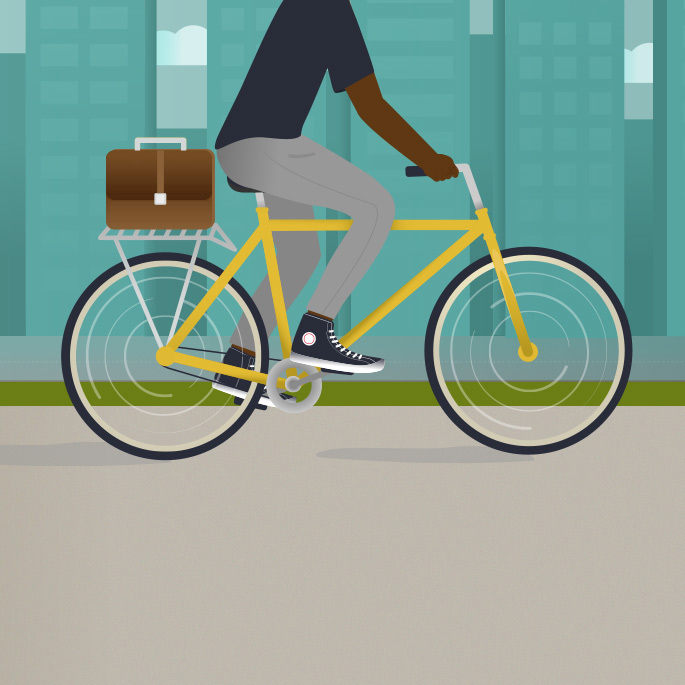 Here’s one change you can make: ride a bike to work. If city dwellers worldwide would use bikes for just 10 percent of their urban trips, greenhouse gas emissions from motor vehicles in large cities would drop by 11 percent. Currently, only around 1 percent of urban travel in the United States happens on a bike, but cycling is on the rise. The number of people who got to work by bike increased roughly 60 percent from 2000 to the 2008–2012 period, according to the U.S. Census Bureau. This was the largest percentage increase among all commuting modes. How far can bikes go? In the Netherlands, 27 percent of all trips taken are by bike. In Amsterdam, it’s 38 percent and in the university town of Groningen, 59 percent of all trips are by bicycle. Here are a few tips to get you on the path to bike commuting. Your bike can make or break your bike commute, so choose one that’s comfortable and practical. The most versatile commuting bike is a hybrid, which is what it sounds like: a blend of road bike and mountain bike. On a hybrid, you’ll sit upright and have better vision and visibility. Hybrids have wider tires than a road bike (more durable and comfortable) but thinner tires than a mountain bike (more mobile). For a longer commute – or a route with hills – you’ll likely want a road bike with high and low gears. It’ll be faster and easier, provided the streets you travel are reasonably flat and in good repair. If you’re riding along rough roads, look into a mountain bike. It can take a potholing and keep on rolling. Keep in mind, though, that the knobby tires will slow you down if your commute is primarily on asphalt. If your commute involves a bus or train, a folding bike could be your best bet. Folding bikes nowadays tuck into small packages that fit almost anywhere. In addition to these basics, you have many other choices, including a cyclocross bike (sort of a beefed-up road bike) and a town bike (what you most often see in European cities). Another, increasingly popular option is an e-bike, which has an electric motor to assist you up hills and/or over long distances. For full details, consult your local cycle shop. Whatever bike you choose, make sure you have full-length fenders in case of inclement weather, some sort of luggage rack or saddle bags for carrying your stuff, lights, a mirror, a helmet, and a comfortable seat that’s not too cushiony or it will chafe. Also consider puncture-proof tires, because nothing upends your commute like a flat. The right route will make your bike commute a more enjoyable experience. The wrong route – one that has trucks, heavy traffic or exhaust fumes – will be stressful and could be dangerous. If you live in an city with dedicated bike paths, seek them out. Your local cycle shop should have maps of local bike paths. Before you use your chosen route to get to work, give it a trial run on a weekend. Time your trip and see how long it takes. Keep in mind that traffic on your route may vary by the hour of the day, and consider a different route to and from work if necessary. Racing out the door and pelting off to work like a sprint cyclist will defeat the purpose. You’ll arrive tired, frazzled and perspiring – and your stint as a bike commuter may be brief. So give yourself time in the morning. This way, you can pedal at a leisurely pace and enjoy the ride. Perhaps stop for a cup of coffee on the way. Also, plan to arrive at the office a little early, so you can catch your breath and prepare for work. Maybe your office has a shower. If so, get one of those chamois towels that swimmers use. They’re a lot easier to carry than a big bath towel. Commuting by bike will take time out of your day, unless you live in a place with regularly bad traffic – in which case it may be quicker than driving. But think of it this way: Your trip to work is your workout, and it will save you the time you would otherwise spend on exercise. Here at CREDO, a lot of us bike to work. We hope you’ll join us soon. 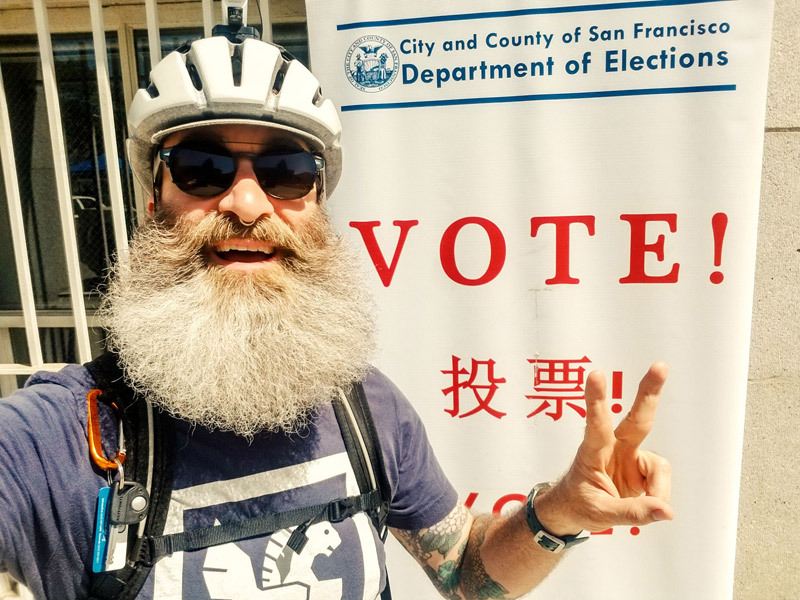 Eric Cohen from CREDO Mobile commuting by bicycle to vote and then go to work. He lives his credo! 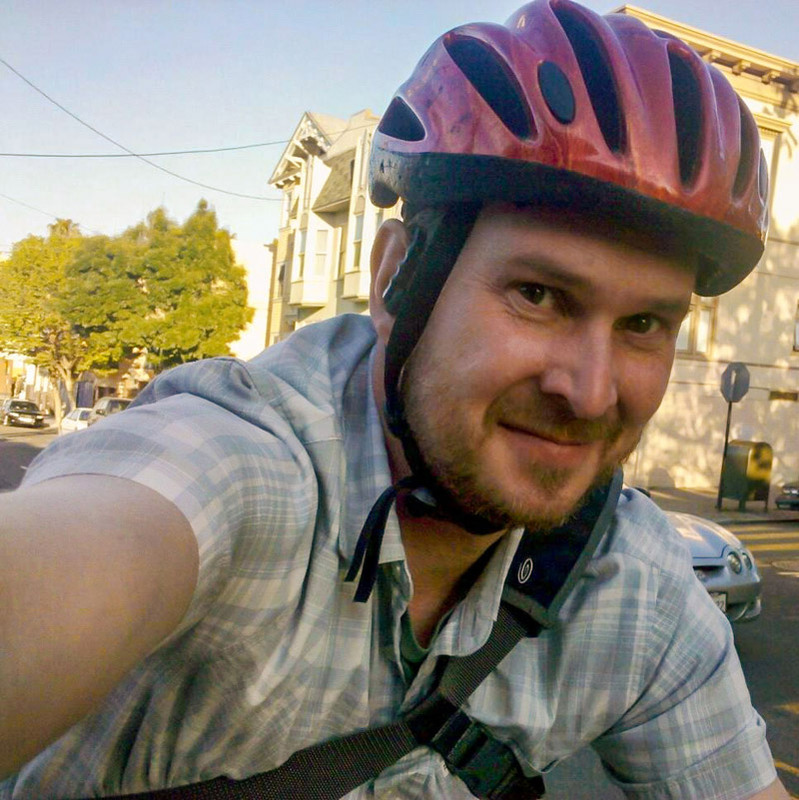 CREDO Mobile’s, Ron Haney, biking to work and stopping for a selfie. Hey, if you biked the hills of SF, you’d document it too!